If you like your science fiction with a dystopian edge, this might be a good book for you. The Afterblight Chronicles is a shared world series published by Abaddon Books. Originating in 2006, with Simon Spurrier’s The Culled and passing through the hands of several different writers over the years, it is a post-apocalyptic vision of humanity in the grip of an uncontrollable virus. 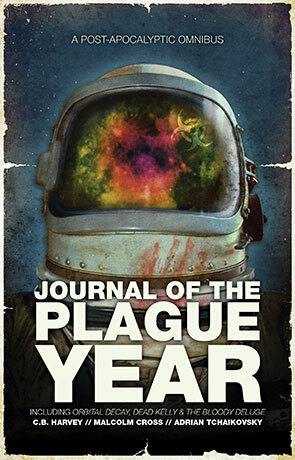 The latest publication is Journal of the Plague Year: three authors writing three stories, sharing the experiences of different people struggling to survive as their friends and families suffer around them. Orbital Decay by Malcolm Cross is a well-executed science fiction thriller. The claustrophobia of a space station, coupled with lingering cold war distrust and the gradual loss of communication with Earth as the virus spreads, makes for a high pressure plot. The search for solutions to the world pandemic in orbit reveals secrets and conspiracies, no doubt linking back to the stories of the previous books. This plays to the strengths of the series; the complementary and concordant storytelling allows for a deeper exploration of the premise and makes the plague (the Cull) a character in itself. Cross tells a good tale, mixing up the delivery of information and exercising a few populist myths into the bargain. The plot twists enough to surprise you and the writing is strong and engaging. The conclusion is obvious in light of the series, but that doesn’t stop the writer using it to offer comment on our assumptions about stories. Next is Dead Kelly by C. B. Harvey. Any post-apocalyptic story set in the outback of Australia invokes images of Mad Max. Harvey wields this together with a nod to the 19th century outlaw Ned. These themes, coupled with the shared world premise make for an interesting mythology mix. Kelly Mcguire’s quest to find who betrayed him in a gold heist before the beginning of the pandemic takes him through a series of adventures and confrontations with his old gang mates. The iconic Kelly armour and dystopian imagery paint a vivid picture, although the plot does start to wear a little thin at times with some eighties adventure comic turns in the middle. The final turn towards the ending initially feels predictable, but there’s a final surprise or two in the mix. One or two themes in the story aren’t quite developed and could have been clearer, but overall a good character based read. Finally, The Bloody Deluge by Adrian Tchaikovsky impressed me right from the outside. There is an assurance to the writing that immediately grabs the reader and doesn’t let go. In the aftermath of the pandemic, Katy Lewkowitz goes back to Poland to rescue her old atheist university professor, Emil Weber, from an uprising of religious zeal. The variety of characters and cultural differences makes for a deep and introspective plot. Adrian does here what fantasy and science fiction does best, asking you, the reader to consider the big questions. In this case, the tensions between faith and science are a constant theme throughout the story and the way in which the viewpoint characters misperceive each other makes the switching perspectives an interesting element in itself. The story develops most in a set piece, which I won’t give away, but as always, placing characters in close proximity for long period allows their similarities and differences to develop. The only minor weakness I would mention in this story is the name for the adversaries – the Order. The generic term doesn’t really do these fanatics justice as Adrian brings a gallery of interesting characters to their ranks, making them appear meaningful and real. All three stories in one volume provides a great contrast of styles and ideas. Journal of the Plague Year is a welcome addition to this ongoing series and a nice introduction to these three writers if you haven’t read their work before. Written on 23rd July 2014 by Allen Stroud.